I rarely pass up the chance to go to the Dripping Pan but last night I committed the cardinal sin. I put the gravy train of the Champions League above grass-roots football, or to be even more precise, corporate hospitality at the Emirates over the Ryman Premier League at the Dripping Pan. I hope I can find your forgiveness in some way and I promise not to do it again….unless someone else wants to invite me in the luxurious surroundings of an Executive box. My decision tree was influenced by the grade of the opposition rather than a promise of fine food and fine wine. Borussia Dortmund are one of the most exciting teams to watch in the world today. It doesn’t seem to matter that every so often they offload a player for small change (Mario Götze’s €37 million deal to Bayern in the Summer for instance), there is always someone new in the wings waiting to come in. The Emirates is a very easy stadium to get to via public transport from Central London. Not so easy to get away from but we will deal with that later. Just 25 minutes after leaving the office I was at Drayton Park, just in time to see the 3,000 strong Dortmund fans marching down the road towards the stadium. Whilst they were being minded by the Met Police, the only issues they faced was having to use earplugs to drown out the noise. The pre-match hospitality was first class as you would expect from one of the best stadiums in Europe. Our host was Sammy Nelson, the ex-Arsenal full back probably most famous for once dropping his shorts in front of the North Bank after scoring a rare goal (and being subsequently fined and banned) who spoke with real passion about the club and the current side. 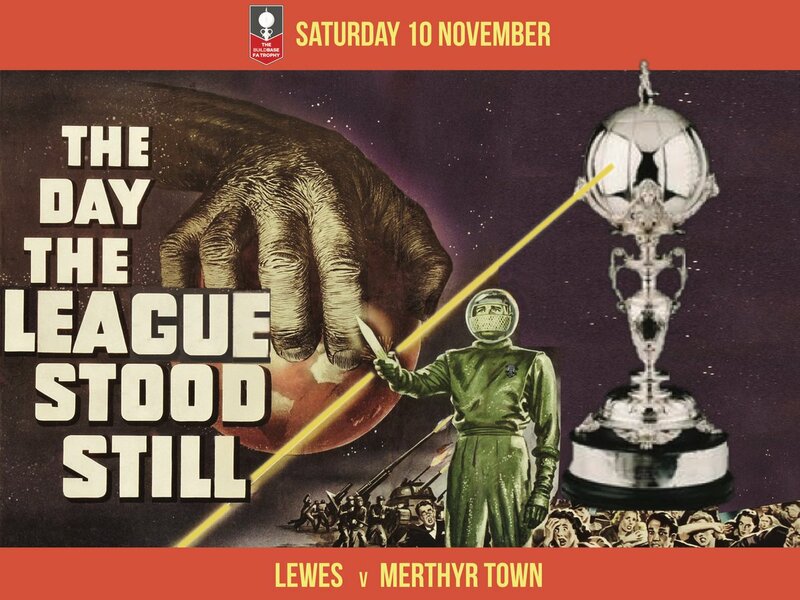 Talk turned to “that” goal on Saturday although he didn’t agree that Nicky Wheeler’s goal for Lewes at the same time versus Leatherhead on Saturday was better. We were surrounded on all sides by Dortmund fans, with the boxes either side hosting German football fans and below us were the massed ranks of yellow and black. Thousands of words have already been written about the game but it is rare that you can walk away from a match still trying to catch your breath. I’m sure the 50,000 or so Arsenal fans may have viewed it differently, but for long periods in the game, Arsenal were simply chasing German shadows. One passage of play in the second half summed up the difference between the two sides perfectly. Dortmund kept possession of the ball for 3 minutes solid. I have no idea how many passes were involved but Arsenal couldn’t get near them. Then a pass went astray and Sagna at full back simply lumped the ball up field where there wasn’t an Arsenal player within 30 yards, only to give the ball back to Dortmund to keep possession for another long period. Moral of this story? If you keep possession of the ball, you wont lose. Dortmund deserved their victory. They set out a clear plan from the first minute and executed it with perfection. Without any bias in watching the game I enjoyed it as a neutral, being able to pick out the strengths and weaknesses in both teams. Make no mistake, this is an outstanding Arsenal side who are one or two players short of being a real force once again, but they didn’t seem to modify their tactics to cope with the obvious counter attacking style of the Germans. But what else did I learn from a rare foray into the Champions League? Well, how about these five points. “Will you still need me, will you still feed me, when I’m sixty four” – The game marked Arsene Wenger’s 64th birthday and I had expected a Beatles tribute band at some point, or even a rendition of their famous song by the players but there wasn’t even a titter or a big birthday cake in the shape of a gun. Where was the birthday spirit of the fans? Surely a spontaneous “Happy Birthday” would have been nice? Poor Arsene will have gone home thinking that his “family” forgot his special day. “It’s typical of Arsenal to try and walk the ball into the net” – For years that statement has been used as an excuse as to why Arsenal haven’t won major trophies. But that’s rubbish isn’t it? Try suggesting to Bayern Munich or Barcelona that their passing game doesn’t win trophies. Last night Dortmund completely out-Arsenaled Arsenal with their passing style. Despite the home side having over 55% of the possession, Dortmund always looked more dangerous as they broke. Arsenal completed 7% more of their passes (78% to 71%) but the Germans covered over 117 kilometres during the game, nearly 10% more than the home side. Meaning? Dortmund pressed Arsenal when they attacked them but turned that defence into attack quicker than the Gunners. Outstanding to watch for the neutral. 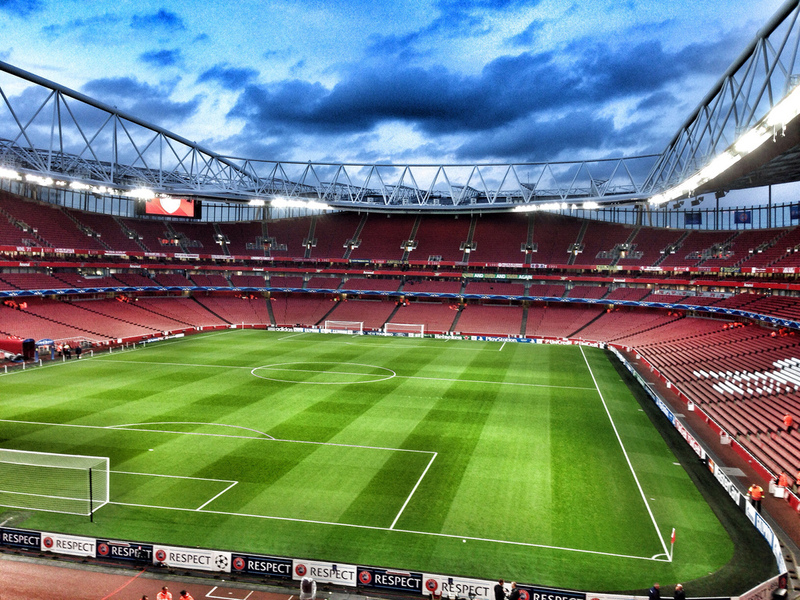 “A stadium befit of the Champions League..as long as you don’t want to see any replays” – You cannot deny the Emirates is the best club stadium in England, and one of the top ten in Europe. Ignoring the plush surroundings of the box I was in, and the outstanding food, it has been designed with the fans in mind. Decent leg room, comfortable seats, reminders of the glory years around the hoardings and the link back to the past with the clock from Highbury’s old South Bank. But which designer decided to put the video screens under the roof so that only people in the lower tier can actually see them. It appeared as if both teams were playing 6-a-side based on the display of the team line ups. 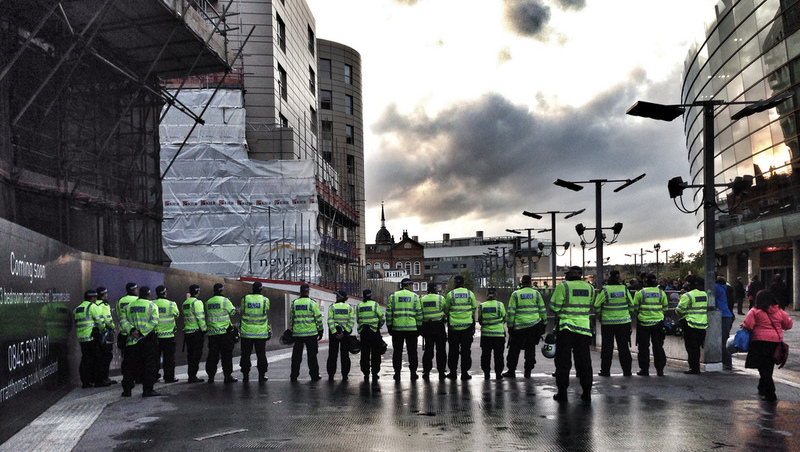 “Sshhhh…we forgot you were here” – Arsenal fans have a bad rap for being on the quiet side. Highbury was perhaps cruelly referred to as “The Library” for many years primarily because it rhymed. The Emirates isn’t any different from 90% of Premier League grounds in this country. Until the football authorities see that fans standing together doesn’t constitute a riot we will never have the same atmosphere as we see abroad. Last night there were a few songs and a little bit of vocal backing for certain players, but they were drowned out by the incessant noise of the away fans. No disrespect in that as I am sure the travelling Gunners will make a fair din in Dortmund in two weeks. But it is always a shame to see so many fans leaving with 10 minutes to go. Yes, it was pouring with rain and yes, the public transport in London is a nightmare, but your club needs your support. Ten minutes after the final whistle as the Dortmund players celebrated with their fans and the rest of the stadium was almost deserted. “Meanwhile, in the away corner” – As the Arsenal fans trooped off into the night, the party was just beginning in the away corner. 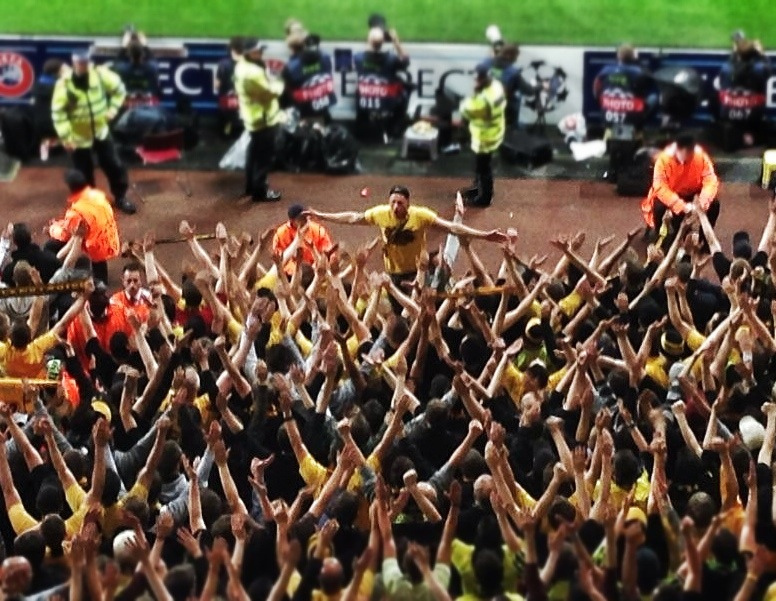 The Dortmund players came to salute the crowd, who had been magnificent. But they didn’t stop at the barriers. They hopped over those, and walked along the front of the stand high-fiving as many fans as they could. Some players took off their shirts, throwing them into the mass of yellow and black. And when each member of the squad had done this, the lined up facing the fans and saluted them. We don;t see the same affinity between fans and players in England. 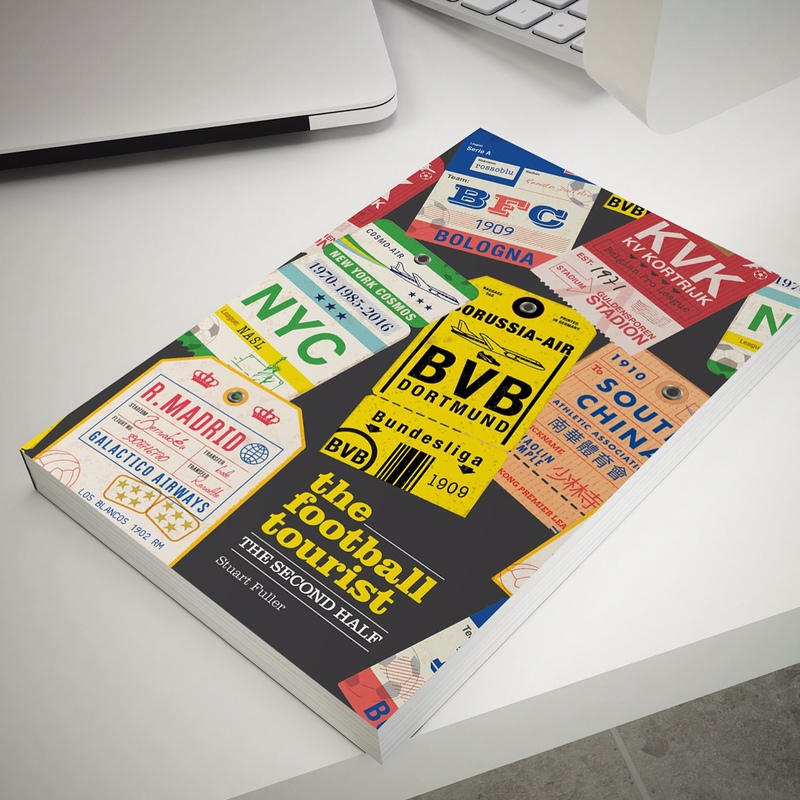 Players simply view fans as an inconvenience in many ways, yet here it was clear to see that all of the Dortmund players had bought into the ethos of the fan being at the centre of the whole club. So overall a very enjoyable evening. Was it better than a night at the Pan? Of course not, especially as the Rooks won 3-1 but sometimes it is nice to have steak instead of chicken…especially if the former is marinated in a roast garlic jus whilst the latter is in a luke warm pie. This entry was posted in Bundesliga, European Football, Germany, Non league football and tagged Arsenal, Borussia Dortmund, Champions League, Emirates. Bookmark the permalink. Great stuff as usual, Stuart. Excellent, Stuart. Going to a Champions League game was a rarity for me too, but I’ve followed Dortmund since living in the area as a student, so didn’t want to miss out. It’s great that there is still that rapport between players and fans which was so evident at the end.